Your personal weather station ensures you stay ahead of potentially hazardous weather conditions and helps you prepare accordingly. It gives you all the information about wind direction and speed, humidity, rainfall, and, of course, the ambient temperature. It’s hard to over stress the importance of having accurate temperature readings if you choose to tour the country in an RV. In fact, there are so many available options that choosing the best weather station for RVs may not be exactly easy. This is why I’ve made a selection of the best models you can currently find. The write-up also features a section about the characteristics you should look for so you can make an informed choice. What Is an RV Weather Station? An RV weather station is basically a multi-component device that allows you to precisely measure and log the weather at your location. Like other weathers stations, the ones for RVs come in different sizes and shapes. Most units, on the other hand, consist of a display, temperature probe, and a thermometer. There are two types of RV weather stations: wired and wireless. The wireless option is much easier to install than the wired. But if you choose to get a wireless RV weather station, you need to ensure it has a stable wireless connection to prevent loss of signal or inaccurate weather readings. Since a weather station can significantly improve your RV travel experience, there are a few things to consider before getting one. Ease of installation and setup is a feature to keep in mind, especially if you want to install the weather station on your own. Obviously, standalone units are the easiest to install. On the other hand, models that feature a separately mounted anemometer should give you better readings. What is the Weather Station Update Interval? The update interval can range from 2.5 seconds for top-of-the-line models to more than 30 seconds. In general, you should avoid weather stations which update every 30 seconds or more if you’d rather have up-to-date info. Quick update intervals are also important if you need to measure fast-changing weather conditions such as wind direction and speed. Does the Station Work at Higher Elevations? A characteristic of RV weather stations that is often overlooked is the elevation limit. But if you wish to spend some time in the mountains, this feature is something you should consider first. RV weather stations can perform at elevations from below 6,000 feet all the way to 12,000 feet for the top-of-the-line models. 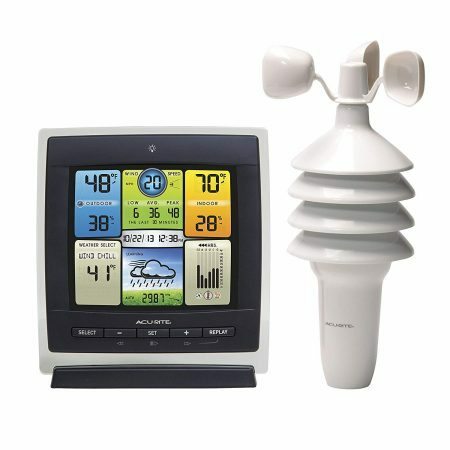 The AcuRite 00589 Pro is a 3-in-1 wireless weather station that can provide accurate humidity, temperature, and wind speed readings. This model falls in the affordable price range and offers excellent value for the money. This RV weather station comes with a nicely designed color display for all of the necessary readings. It shows the current indoor and outdoor temperature, wind speed, history chart, and seasonal records and information. The latter lets you choose between wind chill, heat index, and dew point readings. On top of that, the AcuRite 00589 uses a self-calibrating forecast technology. The unit combines local weather observations with cutting-edge weather prediction modeling to deliver the most accurate weather forecast for your location. This RV weather station also comes with a 14-day learning mode which uses an algorithm to analyze temperature and pressure changes. 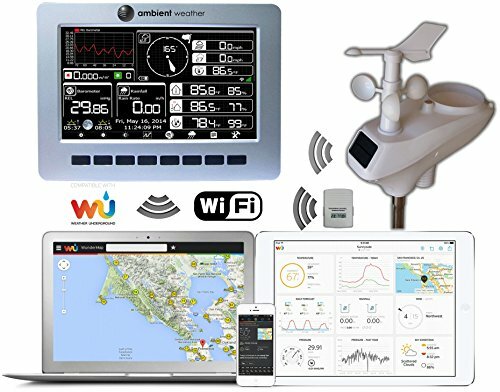 From the specifications alone, the Ambient Weather Observer is easily one of the, if not the best weather station for RVs. Its array of sensors measure exceptionally accurate readings of various indoor and outdoor weather parameters. For the outdoor, the display shows wind speed and direction, humidity, temperature, and rainfall. In addition, it also gives you solar radiation and UV indices. The indoor readings include barometric pressure and indoor humidity and temperature. But that’s not all. The display also shows a combined graph with temperature, humidity, and pressure trends together with rainfall and dew point. In addition, this model comes with a free cloud-based service which allows you to view the weather parameters on your computer or mobile device. The outdoor unit is solar-powered (or 3x AA batteries when there’s no sun), while the display console runs on AC power (either your car’s or 2x AAA batteries). The batteries are not included. As long as you don’t let the batteries run out, your weather data won’t be erased in case of a power outage, though it is advisable to get a UPS backup to be sure. As if to prove that a reliable and precise wireless RV weather station doesn’t have to break the bank, I present the budget-friendly Oregon Scientific BAR208HG. In fact, the BAR208HG comes with weather forecasting features that can give more expensive models a run for their money. The unit keeps track of outdoor and indoor humidity and temperatures and logs temperature extremes. On top of that, this RV weather station has a self-setting atomic clock against various time zones and you can set it to 12-hour or 24-hour format. 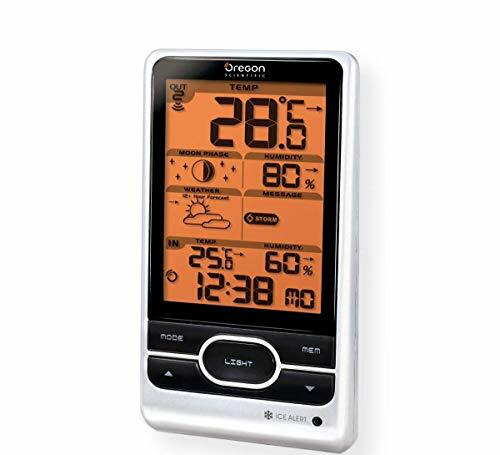 Besides humidity and temperature, the Oregon Scientific also provides moon phase information and warnings in case of fog, storm, heat, wind, and frost. The unit measures only 3.7 x 2 X 7.1 inches. An accurate weather station can save you a lot of trouble when touring in your RV. Hopefully, there’s enough info here to set you on a path to choosing the best weather station for RVs no matter what your needs may be. The Ambient Weather WS-1002-WiFi stands out for its exceptional array of sensors and Wi-Fi connectivity. It also features a swift 16-second wireless update rate for further peace of mind. Weather Station Guide is a participant in the Amazon Services LLC Associates Program, an affiliate advertising program designed to provide a means for sites to earn advertising fees by advertising and linking to Amazon.com. Amazon and the Amazon logo are trademarks of Amazon.com, Inc. or its affiliates.